I was surprised that when I decided to run after the sunscreen station that I could actually run. Maybe those brick workouts really did help? As I ran under the Run Out arch I clicked my watch over to the run and was trying to switch it to the screen with heart rate. One volunteer then shouted, "You've got plenty of time, don't even worry about your watch!" While I wasn't really worried about my pace it was a little bit of a revelation to me that I had a ton of time to finish. I had set up my watch for intervals of 5:00 running/:30 walking and that was my tentative plan for the run. It was set up to beep at those intervals but I had turned the vibration feature off to conserve some of the battery in case I was out there for a long time. Good plan, poor setup because when the crowds were cheering I could not hear my watch at all. In the first mile, you run around the capitol and onto state street. By the time I got out onto the run course, the first pro finisher was only about 15 minutes away from the finish line so the crowds were already gathered near the finish. It was loud and awesome. The bibs had our names on them so spectators would often yell "Go Alyssa!" which to me, makes the cheering even more awesome. When my first mile ticked off at 9:40, I realized I was going way way too fast. In no way was I going to be able to run the marathon that fast so I slowed down. Every time I reached an aid station I would slow down and walk as well. One the way out, you run through Camp Randall (the Badger's stadium), the turf feels really good on the feet (and felt even better on the second lap). A photographer was snapping pictures on the field and it made me wish I had written "Go HAWKS!" on the backside of my bib. The course continues out towards the campus area. For the majority of this part I was running and walking only at the aid stations and hills. Around mile 4, I saw Rachel and her husband cheering! She asked me how I was feeling and I responded, "Okay." I'd say that's pretty good for just biking 112 miles! I got to see them two more times as the course passed by them again. It was so nice to have her cheering out there because those miles were some of the lonelier miles! Around miles 5 and 6, I once again ended up on State St. -- this time a little further out from the capitol -- this area is the bar area and the streets were packed again. It is always great when people are cheering for you and telling you that you look great. Kristin and Molly were here again and Kristin ran alongside me while Molly snapped some photos. Kristin told me that Matt and my mom and dad were cheering around mile 12 and that I would see them there. That gave me something to look forward to and I kept ticking off the miles. Around mile 11 as I ran back towards the capitol and the start of lap 2 I hit a bit of a low spot. I realized that I had to run that whole loop again and I was getting tired. The novelty of the run course had worn off. I knew the hills would be coming. Plus it doesn't help that the turn for 2 is so, so close to the finish line. I was walking a bit more during this portion and right before mile 12 I saw my cheer squad again. Matt walked with me for a bit and tried to show me the time on his watch. I stared blankly at his watch because my mind was tired and I could not read the clock. He told me that it was so early and that I was going to finish. I conjured up some more energy and started running again. State Street was just as awesome going through again and that pumped me up. Going close to the finish line wasn't too terrible and I made the turn for the 2nd lap. Right after the turn is the run special needs area. My back was tight and cramping so I stopped to get my packet of Biofreeze to loosen it up. While I stopped, the volunteers offered me a chair to sit in and I turned them down by saying, "If I sit now, I might not get back up!" 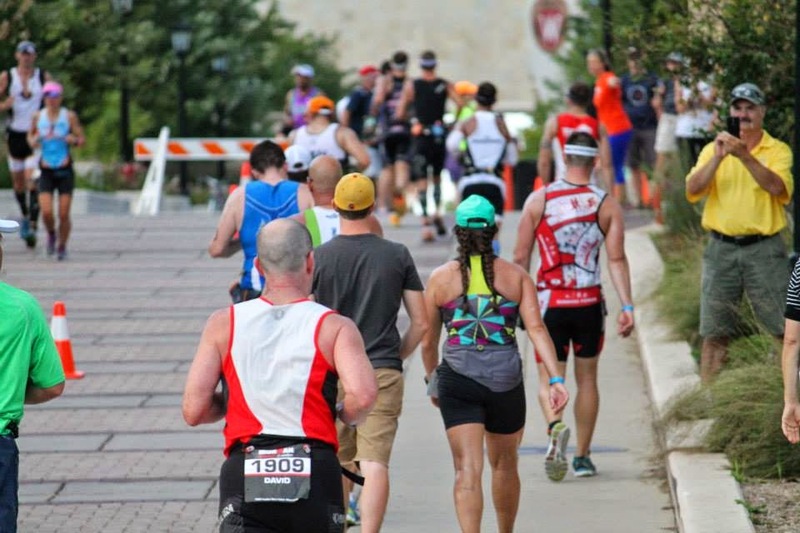 Before the race, I read a lot about the mental aspects of racing an Ironman and one of the things that stuck with me is that the race will have high points and low points--be prepared for them. Miles 11-13 were one of those low points for me. But soon I was feeling a little better and the second lap didn't seem to bad. My pace slowed down on the second lap but I was still mostly running (that looked more like a shuffle) and walking anything that looked remotely like a hill and all the aid stations. I was only able to eat one Gu on the run and the idea of eating more sounded terrible so instead I drank Perform and cola and ate orange slices. When the chicken broth came out, I took a cup of that wherever available. The salty goodness was like liquid gold. It was warm and even though I wasn't cold (I still took sponges and cups of ice at a lot of aid stations), the warmness made it go down so easily. The second lap was more of the same. I did see a lady running without shoes on and she was carrying her Vibrams-like shoes in her hand. Amazingly, I did see her finish later in the night too! My feet were killing me. The good news is that they hurt so bad I didn't even know my legs hurt. The longest training run I completed was 16 miles and that hadn't gone well at all so I was thrilled when I passed 16 miles and was still moving along. I passed the 20 mile marker and it was still light outside. I thought to myself that maybe I would be able to finish before it was dark. That turned out not to be true but it kept me running for a bit. I remember a wave of relief when I started heading back toward the capitol again. Only a little bit longer I thought. I was both passing and being passed by people and a few times we would speak a few words to each other. Around mile 24 I picked up a glow necklace at an aid station. The sun was setting quickly. Getting back to State Street and the loud music was a huge boost. I knew the finish line was close. I walked one final time on the hill near the Capitol Building and then I started running towards the finish line. The crowds were so amazing. It seemed everyone was cheering for me. I made sure to space myself out from the other finishers so I could have my own moment of glory across the finish line. I took my time high-fiving a whole bunch of spectators. Matt tried to snap a pic of me but I guess I was moving too fast! 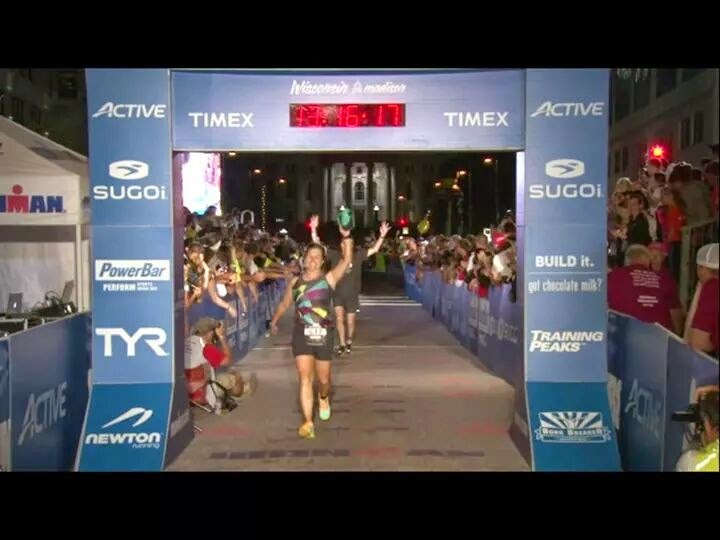 I crossed the finish line and I heard Mike Reilly say "Alyssa Neiers, you are an Ironman!" 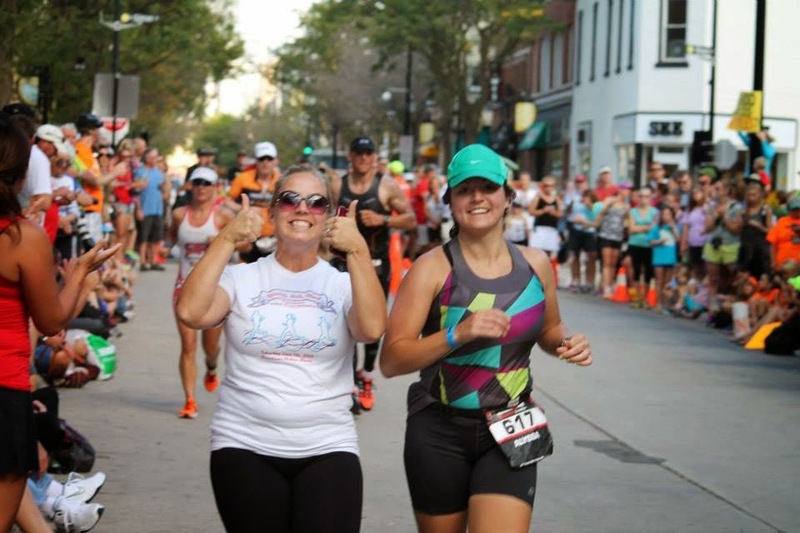 I had the world's largest grin on my face as proven by my finisher's pictures. I was immediately helped by two finisher's line catchers and as they started walking with me I was just overcome with emotion. I started to hyperventilate a bit which caused me to start coughing. The volunteer asked if this was my first Ironman. And when I nodded she just said, "I understand, it can be emotional." And it was. I was so amazed by what I had just done. The volunteers walked me over to get my timing chip taken off, then to get my medal, finisher's shirt and hat. Next they got me chocolate milk, water, and tried to get me a space blanket, but they had just run out. Instead I told them I was fine and got in line for my finisher's picture. I was a little bit in disbelief as I wandered over by the athlete food tent. My family was standing nearby so I talked to them for and my mom kept asking me if I was okay and if I could walk. I thought I would be so exhausted I wouldn't want to walk another step, but I was surprisingly feeling okay. My mom later told me that she thought was my cough was so pathetic at this point. Every time I coughed it was really painful and yet the cough was so small. My lungs were all seized up from the long extended effort. I hit up the athlete food tent for some crappy pizza, a sub, and some orange slices. And I finally found a space blanket. I didn't need it right away but it definitely came in handy later when I started to cool down. I waited for Kelly while eating some of my food and resting on some steps. Getting back up was hard! I was so excited when Kelly came down the chute! I tried to take a video but I had Ironman brain and forgot to press record. Duh. After watching Kelly, I hugged my parent's and we all took off for our respective accommodations. Ironically, I made it through the Ironman without any tears but I cried in the shower because holy chaffing! Owwwwwwwww! I had some big spots. Matt headed off to bed because he has limited vacation and had to work the next day. I was all pumped up on adrenaline still and headed back to the finish line to cheer in the final finishers. 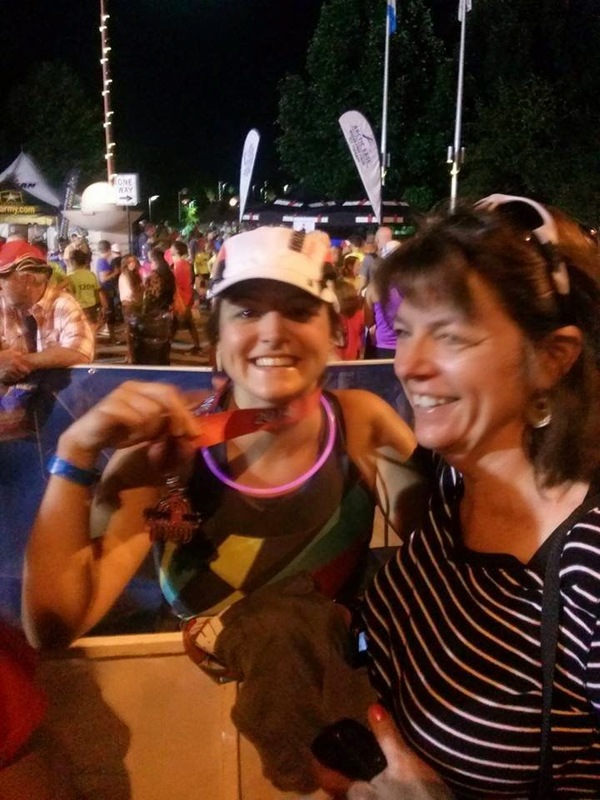 If you want to be inspired, the best place to go is an Ironman finish line close to midnight. The energy was amazing. Out of this world amazing! I cheered my heart out as people came in closer and closer to midnight. I even shed a few more tears as the final finishers crossed that line. These people pushed themselves to the limit to make it to that finish line. I had a wonderful, wonderful race experience and it is still hard to believe how well the race went for me. My mantra for the stay was "In the box" and I think I did a good job staying on my race plan. Even looking at my run splits, I did a good job of continuing to "run" late in the race and only had one mile over a 13 min/mile pace. It seems like almost a different person that wrote this post about all of my doubts leading up to the race. When I forget again will someone remind me that I can do hard things. Many years ago I pitched the idea of a triathlon to Matt. He thought I was talking about doing a full Ironman and told me that was crazy. That planted the seed in my head that some day I would do a full Ironman. I finally realized that dream. Thank you to everyone who cheered me on--both online and in person. My spectators were absolutely wonderful and seeing them always boosted my spirits.